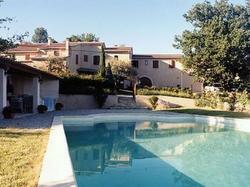 Domaine le Puy du Maupas features its own wine cellar and outdoor swimming pool. It is located 40 km from Orange and is just a 10-minute drive from Vaison la Romaine Medieval Village. The soundproofed rooms include garden views and a desk. The en suite bathroom is complete with a hairdryer and free toiletries. A breakfast buffet is available and serves homemade jam and grape juice. Local wines can be sampled in a wine tasting session at the hotel or guests can relax in the lounge. The hotel is located just 15 km from both the bottom of Mont Ventoux and Dentelles de Montmirail Mountain Range. Marignane Airport is 120 km away and free private parking is available on site. This soundproofed room features garden views and a desk. The en suite bathroom is complete with a hairdryer and free toiletries.